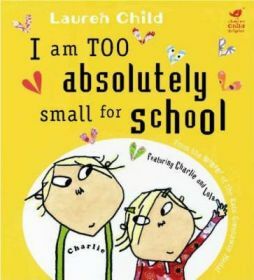 ‘I am Too Absolutely Small for School‘ is a brilliant book which is written by Lauren Child and features the characters Charlie and Lola who can be seen on Cbeebies most days. This is an animated TV series which centres on a boy called Charlie, who I would guess is about seven, and his younger sister Lola who is probably about four. Lola always has very strong opinions about lots of things, and Charlie always tries to put her straight! The TV series is really quite endearing and the same can be said of this book too. ‘I am Too Absolutely Small for School‘ is Lola’s opinion when she discovers that she is soon to start school. She claims that she is really far too busy with lots of important things to do at home and will not have time for school. As we go through the book, big brother Charlie tries to reason with her telling her about all the things she will be able to do, like learning her numbers up to 100, and learning her letters so she will be able to write notes to people and read books, and so on. For all of these reasons though, Lola has her own argument – she only needs to count up to ten and she can always phone people rather than send messages! Lola finally agrees that she would really like to learn all these things, but really what she does not like is the idea of wearing a uniform or eating school dinner. Charlie points out that she can wear what she likes and she can take a packed lunch. Charlie’s final argument is that Lola will make lots of new friends at school, to which Lola replies that she doesn’t need new friends, as she has her own friend – Soren Lorensen, who is actually her imaginary friend. Charlie points out that Soren will be going to school and will be very lonely and scared without Lola to look after him! This is the argument that sways Lola, who in due course heads off to school, only to find that it is not as bad as she thought it would be! I think that this is a very enjoyable and amusing book, but also would be a good one to share with a child before they start at school. It brings up lots of worries that children might have, but would also give them the chance to think of other worries as well. I am sure thoughts about uniform and school dinners are big worries to some children. My youngest daughter has just started school and she really enjoyed reading this book before she went. Most of the book is written as a conversation between Charlie and Lola, and the words sound just like they are spoken on the TV programme. This is quite a challenge for a parent reading to a child because you want to get the voices right and my daughter is quite happy to point out that Lola wouldn’t say it like that! Lola also has a really funny turn of phrase which I love, many of which make her sound like a little old lady! The way that the text is set out in the book is very interesting too! On each page, Lauren Child has done something different with the layout – sometimes the words are different sizes, on other pages they are dancing and swirling all over the place (a bit like Lola!). The words are very rarely set out as traditional text in straight lines! Although this is fun and makes the pages more appealing, I would not recommend it for children who are just starting to read as the words would be very difficult to follow! The illustrations are lovely – Charlie and Lola are just very simple line drawings but manage to have very expressive faces as well. All the illustrations are the same as the animated characters on TV. We really recommend I am Too Absolutely Small for School – it is definitely still one of my daughters’ favourites. No Comments on "I am Too Absolutely Small for School"